A mid-cycle refresh brings to the forefront of luxury sedans, coupes, and convertibles the new 2019 Mercedes-Benz C-Class. Although many things remain the same for the model year, Mercedes-Benz has seen fit to amp up the power on both the C300 and AMG C43 engines. Additionally, the C-Class line-up is even safer to drive thanks to several crucial improvements and additions made to its standard and optional safety features. But fans of the previous year's C-Class ought not to worry; Mercedes-Benz has kept the features and level of luxury that customers enjoy. New for the 20919 Mercedes-Benz C-Class line-up is a power boost for the C300 engine (which now generates 255 hp) and the AMG C43 (a 3.0-L turbo V6 that is able to get 385 hp, which is 23 hp more than the previous year). The C300 model now has the 2018 AMG C43's grille while the new AMG C43 sports a shiny new grille atop a black mesh backing. The interior has also received some updates, including a new steering wheel, an optional 10.3-inch touchscreen display, and a digital instrument cluster. As far as safety features go, upgrades have been made to the Mercedes Me phone app, and there is now an active emergency stop system that prompts the vehicle to slow down and put on the hazard lights when the driver fails to respond to cues from the Attention Assist function. One of the best aspects about driving the 2019 Mercedes-Benz C-Class is that the acceleration is quick but smooth. With the increase in horsepower for the C300 and AMG C43, the difference from last year is noticeable. The C300 can sprint from 0 to 60 mph in a solid 6 seconds while the AMG C43 gets there in just 4.6 seconds. The transmission provides effortlessly smooth shifts while in normal mode, and when you flip it into sport mode, you get a more aggressive performance. Braking on the Mercedes-Benz C-Class line-up is solid no matter which model you select. Automatic emergency braking comes standard on every C-Class vehicle, and it does a fantastic job of aiding the already easy-to-modulate brakes. Even when you press down hard to make a panic stop, the brakes feel as though they are under control. During everyday driving scenarios, the brakes feel appropriately light to the touch. Steering on the 2019 Mercedes-Benz C-Class is, as should be expected of a luxury vehicle, incredibly precise. The electric power steering, which comes standard across the line-up, is rapid to respond and provides the driver with ample feedback from the road regardless of which driving mode you have the vehicle set in. On the highway, steering becomes firm and secure, and in parking lots and along slow urban roadways, it becomes lighter and easier to navigate. Although rear-wheel drive comes standard on the new C-Class, all-wheel drive is available and is highly recommended. The all-wheel drive system gives the vehicle a substantially greater amount of traction, and, when paired with sticky summer tires, makes the driving experience in drier climates feel that much more secure. And, of course, all-wheel drive is always a welcome addition for those who have to make it through rough winter months. Another optional aspect of the 2019 Mercedes-Benz C-Class that comes highly recommended is the Airmatic suspension. The C300 Cabriolet especially benefits from having the Airmatic suspension equipped since the Cabriolet tends to suffer from some ride quality issues. The Airmatic suspension smooths out bumps well and makes the ride feel a lot less firm. The Airmatic's comfort setting is accommodating and enjoyable. Sport mode feels appropriately spunky as well. The interior of the C-Class is not just luxurious; it is comfortable. Even though the base sport seats might feel a bit firm at first, they offer plenty of lumbar and lateral support for all of the vehicle's occupants. The performance seats take it a step above by adding heating and ventilation functions for additional comfort. Even though the rear seats tend to be slightly small, they are nonetheless relaxing to sit in for long rides. Wind and road noise levels are kept to a minimum in all of the 2019 Mercedes-Benz C-Class models thanks to the well-insulated interiors. Even the convertible Cabriolet has a quiet interior thanks to the Aircap system. The Aircap system (which was introduced on the E-Class Cabriolet) reduces the turbulence you experience with the simple push of a button. A wind deflector lifts the airflow while a drought-stop works to lessen the back-flow of air. Features on the C-Class's instrument panel are now easier to use than before thanks to the redesigned panel. Drivers are not inundated by a ridiculous number of knobs and buttons, but the ones that are there are clearly marked and ultimately intuitive to engage. Android Auto and Apple CarPlay are both easy to use is you prefer smartphone app integration over the similar functions made available by Mercedes-Benz. In fact, those who are not technologically savvy might enjoy using the smartphone app integration on the C-Class. Yes, the 2019 Mercedes-Benz C-Class is an entry-level luxury vehicle, so quality is a 'must' inside and out. The C-Class has a particularly stunning interior, even for its class. The C-Class even rivals some of the higher-up luxury vehicles in terms of its interior materials. No cheap, hard plastics are to be found, and everything seems to be seamlessly woven together to create a superbly plush cabin. Driver aids are quickly becoming a determining factor in why people choose to buy certain vehicles, and Mercedes-Benz recognizes this trend. The C-Class boasts a solid list of driver aids, including a forward collision warning and mitigation system with automatic emergency braking. Taillights and headlights are now LED, as per the standard. Blind-spot monitoring and adaptive cruise control are optional. As far as functionality goes, the driver aids seem to respond appropriately and do not become intrusive for the driver. The biggest drawback to driving the 2019 Mercedes-Benz C-Class is the lack of cargo space that you get. Of course, if you are buying this vehicle for leisure or sport, you probably won't expect to need much cargo space. However, daily drivers will notice the lack of space. With all seats in place, you can only get between 8.8 and 12.6 cubic feet of cargo space. Another issue regarding the use of space in the C-Class revolves around the way small item storage areas are designed and organized. Unfortunately, the cup holder bins feel a bit diminished, as do the rest of the pockets and bins you will find scattered throughout the cabin. The center arm rest is where the USB ports are located, which seems a little counter-intuitive. Visibility is not awful on the 2019 Mercedes-Benz C-Class, but it can be somewhat limited depending on which model you decide to buy. For example, in the Cabriolet, the rear blind spot is pretty sizable when you have the top up since the rear window is quite small. Forward visibility is better thanks to the slender roof pillars, but you will have to rely on the rearview camera and optional blind-spot monitoring system to aid your vision. Of course, you can expect to have limited space in the C-Class, especially if you opt for the Cabriolet. Fitting a rear-facing child seat behind the front passenger seat while it is occupied is quite the chore. Passengers in the rear will undoubtedly feel a bit cramped as well, so taller passengers will likely prefer to sit up front instead. The 2019 Mercedes-Benz C-Class faces stiff competition from the competitively-priced 2019 BMW 3 Series. The 3 Series also has a new turbocharged 2.0-L engine that gets comparable hp, but since the gearing has been tweaked, you get far more control upon launch. Unfortunately, some drivers might not like that BMW has swapped out the manual transmission and instead placed an overly heavy focus on infotainment technology. The 2019 Audi A3 is another top rival for the C-Class this model year. The A3 offers a chic interior design and several strong powertrain options. The A3 has a stellar braking performance with an impressive ability to come to a short and safe panic stop. However, the A3 loses some points for having a cramped rear seat that can be difficult for some passengers to enter and exit. Like the C-Class, the A3 suffers from a small cargo space and limited size and number of small item storage areas. The 2019 Mercedes-Benz C-Class has multiple strong selling points, especially when it comes to the driving performance. 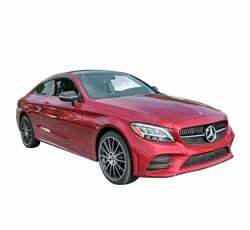 The ultra-lush interior will also certainly lure in a good number of buyers, and the improvements Mercedes-Benz has made to its safety features should not go unappreciated.